Welcome to another Feminist Friday! This week it’s all about the female filmmakers, writers, directors, actors and creators who are slowly chipping away at Hollywood’s gaping gender inequality. Despite years of data research, initiatives, slogans, movements and hashtags carried by celebrities, there has not been much improvement in terms of women in leadership positions especially behind the camera and greenlighting movies and TV shows. So while we wait for the industry to get its act together, we can take heart knowing there are talented, hard-working, badass women changing the status quo and not waiting for permission to do it! Entertainment has the power to change culture, so it is important it reflects it by who we see on screen. We’re checking out 3 videos that are getting us excited for the future of the film industry. 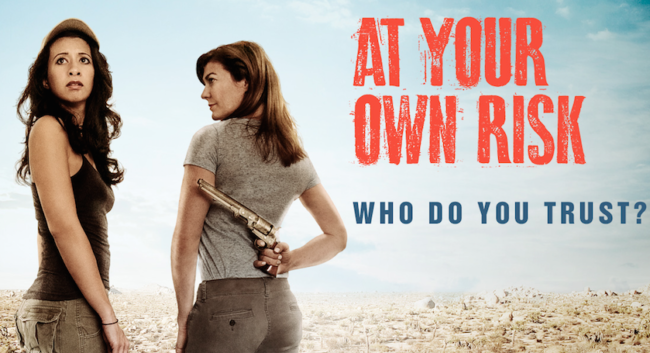 The first is the trailer for a new psychological, female-driven thriller out now on Amazon called ‘At Your Own Risk’, starring Alexandra Boylan and Helenna Santos who play two career driven women are hired to test out a unique treasure hunt deep in the New Mexico desert. Their exciting adventure takes a drastic turn as friendship is tested, and survival is pushed to the limit, and before long they realize that not everything is as it seems. If you are up for a ride full of twists and turns that keeps your brain trying to figure it all out until the very end, watch the trailer below and add it to your Amazon queue! Our second trailer is a comedy that we have previously featured on GirlTalkHQ when it was in the early stages of production. ‘Freelancers Anonymous’ gives visibility to women and the LGBTQ community in the tech industry, but its central themes of relationships, job anxiety and navigating the hurdles of the freelance world make it a film anyone can relate to. Starring ‘Transparent’s Alexandra Billings and a diverse cast that will keep you laughing and “YAS GIRL!”-ing all the way through, it features a group of women who come together to launch a tech start-up company. The story follows Billie who, on impulse, quits her soul-sucking office job and is left to figure out “now what?” She meets a ragtag group of women who are also looking for employment, and is struck with the idea of cultivating their skills to create an app for freelancers. The film is directed by award-winning Spanish filmmaker Sonia Sebastian, and written by Amy Dellagiarino and Lisa Cordileone. What we also love about this feature is that it has received a stamp of approval from ReFrame – the 50-plus-member coalition dedicated to achieving gender parity in Hollywood – which means when you watch ‘Freelancers Anonymous’ you are directly impacting the push toward equality in an industry that so desperately needs it. Officially released on November 11, you can pre-order ‘Freelancers Anonymous’ now by going to the website. Our final video this week is the trailer for season 3 of a digital series whose creator has written about for us previously. Alex Spieth is the creator, writer and star of ‘[Blank] My Life’, and is back after 2 successful seasons with some comedy goodness that we certainly need right now. ‘Blank My Life: Goodbye New York, Hello Hell’ follows the new life of Susan, an out of work, bi-curious, New York millennial, who relocates to Ohio with her current boyfriend after the death of her best friend Brendan. In the small town of Socksville, Ohio, Susan scores a new job, a new girl to crush on, and begins to see a better life on the horizon, outside of New York. Little does she know that Brendan’s ghost traveled along with her to haunt her every move. ‘Blank My Life’ is a surreal comedy about small towns, literal ghosts, and the secrets we keep to leave the past behind. Creator and Writer Alex Spieth again plays Susan, with Benjamin Viertel as her dead best friend, Brendan. The series also features Randy Kovitz (George A. Romero’s ‘Dawn of the Dead’, ‘The Fault in Our Stars’), Donald Chang (UCB), and (rebeca) Rad. ‘Blank My Life’ began in 2015. The first season was hailed as “a unique and personal take on the ‘New York apartment comedy’ drama” and was featured on Jill Soloway’s internet platform as well as IndieWire’s project of the Day. The second season was featured at New York Webfest and Brooklyn Webfest. Season Two streams on BRIC TV and was honored as a finalist at the Brooklyn Free Speech Awards. Blank My Life: Goodbye New York, Hello Hell Trailer from Blank My Life on Vimeo.